I dunno what’s going on in Hackney… looks like they’ve got their act together on the recreation side of things! 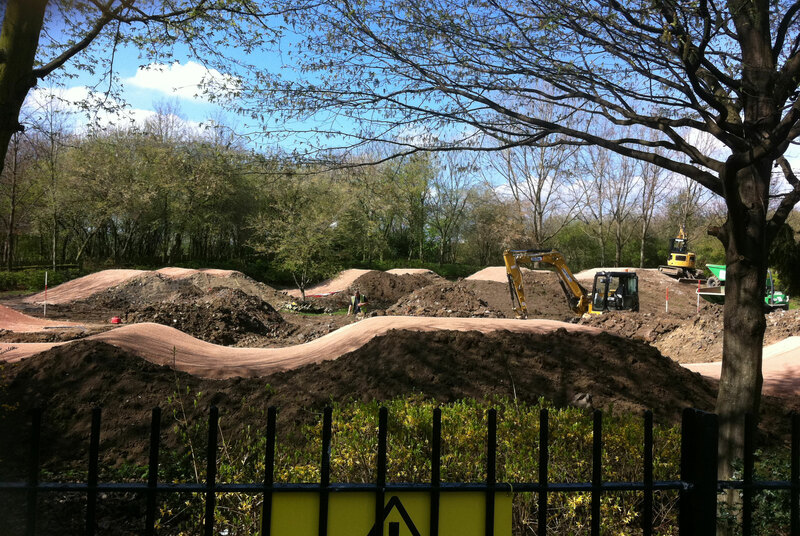 Not only are they building a new skatepark in Victoria Park, but we are also getting an updated BMX track in Hackney. I got a little excited when I saw diggers and huge mounds of dirt near Hackney City Farm but then my pessimism kicked in and I presumed they were just gonna redo the kiddie track. Looks like they are actually turning the place into something that will be fun to ride. When the new bowls in Clissold Park open in April I’ll have two new spots to ride within five minutes of my house. Yay! Oh great! Just what the area needs! A 33 year old man buying a bmx he has nowhere to lock-up , barely afford and has no time to ride just to try and relive a youth he never really lived the first time around. Not looking forward to explaining this purchase to the missus, but I’ll be blaming you somehow Jules. Pingback: rebuild on the Hackney BMX track « 14 Bike Co. Blog « 14 Bike Co. | 14 Bike Co.
Looks Awesome! Gonna be a nice court next to the Stokey bowl for epic polo!